E is for Explore! : Who made that scale?! 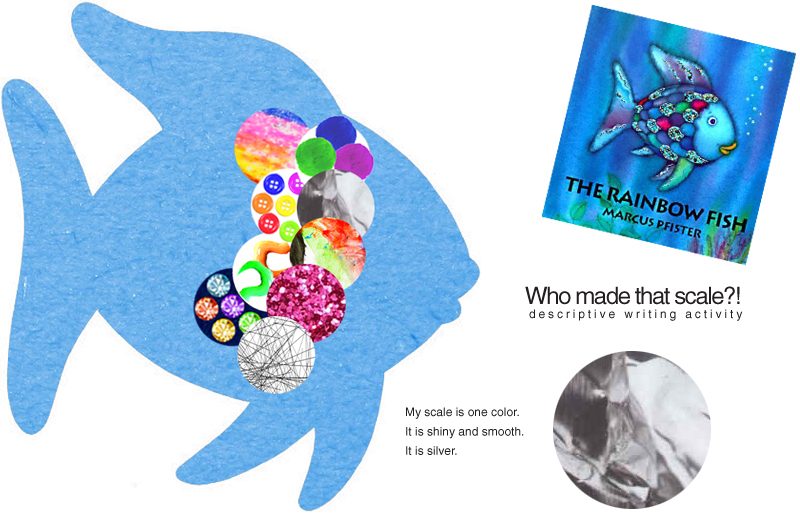 Read the Rainbow Fish by Marcus Pfister, talk about sharing, friendship, and being unique! Have each kid create an original, one of a kind scale for an oversized paper fish for homework. Along with their scale, have them write a couple clues that describe their scale. They bring the scale back in a brown, paper lunch bag with their clues. Remind kids not to share their scale, it's a secret! Lay all of their beautiful scales out on a table. Then, pass out the clues to each child, making sure they don't end up with the clues they wrote. Students must try to find the scale that matches the clues. Who do they think made the scale? Could they find the correct scale that matches the clues? Did they guess the right artist? Then, use their scales to create a lovely fish!